Yes. When applying for a business investment visa (EB5, E-1 or E-2), expanding or starting a business in the United States through an L-1 visa a business plan can be critical. This is especially the case with smaller businesses that have lower revenues or lower numbers of employees. New businesses are also entities for which both USCIS and Consular Officers expect a detailed business plan laying out the growth strategy of the firm in the United States. Our immigration law firm is privileged to represent some major multi-national firms with extensive business operations in the United States. While providing a business plan can never hurt and application business plans are for less critical for this type of client. Officials responsible for training consular officers who review E visa applications have told us that the business plans are critical. The business plan is your opportunity to explain your business concept to the immigration authorities who will make a decision on your visa case. We believe part of our success rate with L, EB5, E and other business visas is, in part, attributable to the time and focus we spend working with clients understanding their business and formulating their business plans. One case our firm handled involved an investment visa. Another law firm had already filed an unsuccessful application for the visa. Comments from the consulate suggested that the business plan filed by the other law firm was not credible and was not reflective of the business described in the rest of the documentation, we believe that the law firm involved had not taken the time to get to know the client’s business and were, therefore, ill equipped to represent it. Our client agreed. Our client had applied for an L-1 visa and filed a business plan with another firm. The business plan did not however allow for certain key elements of long-term growth and contained material that actually illustrated that the client did not meet certain immigration requirements of the law. When the client later applied for an EB-5 visa he was denied owing to errors in the business plan. The client then tried to apply for a “green card” based on his status as an “international manager” using the provisions of EB1C3 and was again denied. If I Already Have a Business Plan, Can I Use it? We believe that it is impossible to properly represent a business immigration client without thoroughly understanding their business. For this reason we insist our immigration lawyers have substantial business experience in addition to their legal practice work. Why are Business Plans Poorly Received in Immigration Cases? ✖ Plans that do not consider future as well as current immigration strategy. ✖ Plans where every sentence has not been reviewed by an experienced immigration lawyer to ensure it conforms with applicable immigration laws and regulations. ✖ Plans that have business inconsistencies or unrealistic assumptions. ✖ Failure of the business plan to properly reflect the client’s strategy as reflected in a consular interview or other documentation. ✖ Inconsistencies between the financial model in the business plan, the rest of the documentation and the immigration regulations. ✖ In one case we reviewed an immigration lawyer missed a critical issue that would have been obvious had they bothered to visit the client’s business location. 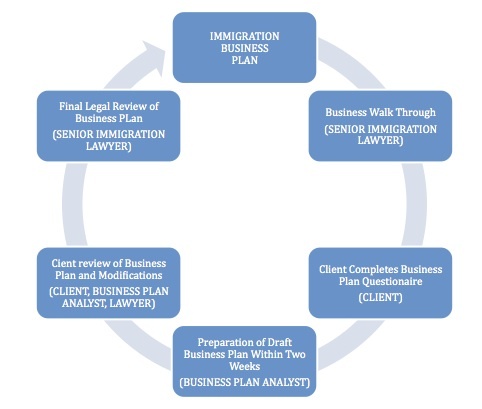 In response to frustration with poorly prepared business plans our firm adopted a unique approach to the preparation of immigration business plans for our clients. How is Davies & Associate’s Approach to Assisting with Your Immigration Business Plans Different? Most law firms do not become substantively involved with the preparation of business plans and do not have experienced immigration lawyers with substantial business plan training and experience to do so. We believe that to represent you properly it is essential for us to thoroughly know your business and ensure not only that every sentence of the business plan is geared to evidencing your case but that the entire plan as a whole paints a picture of a business that is consistent with applicable immigration laws and regulations. Any preferences we are aware of at the consulate to which you will be applying. While it is important to remember that the business plan will always remain your presentation of your own business our experienced team of immigration business analysts and lawyers are ready to assist. An experienced immigration business plan analyst will collate all of the materials we receive on your business and the research we conduct and consolidate it into a draft business plan within two weeks. An experienced immigration lawyer will work with you and the immigration business plan analyst assigned to your case to refine and finalize the plan so that, in or opinion, it is the very best immigration presentation of your business possible. 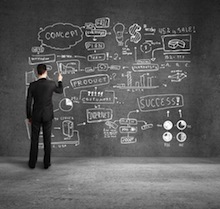 What is the Process for Producing a Business Plan at Davies & Associates? Why do Davies & Associates Visit their Client’s Businesses? Obtaining a business visa for you and establishing a business in the United States demands that we properly and accurately represent your business and your business goals to the United States Government. We believe it is impossible for any immigration lawyer to competently do that without getting to know you business and, ideally, visiting it. In addition our firm seeks to be your long-term partner to success and actively seeks to fully and completely understand your business so we can assist you meet your business goals.